2014, Marill J. et al. Nano Publications > Publications > In Vitro in Vivo NBTXR3 > 2014 – NBTXR3 concept and dose enhancement – Marill et al. 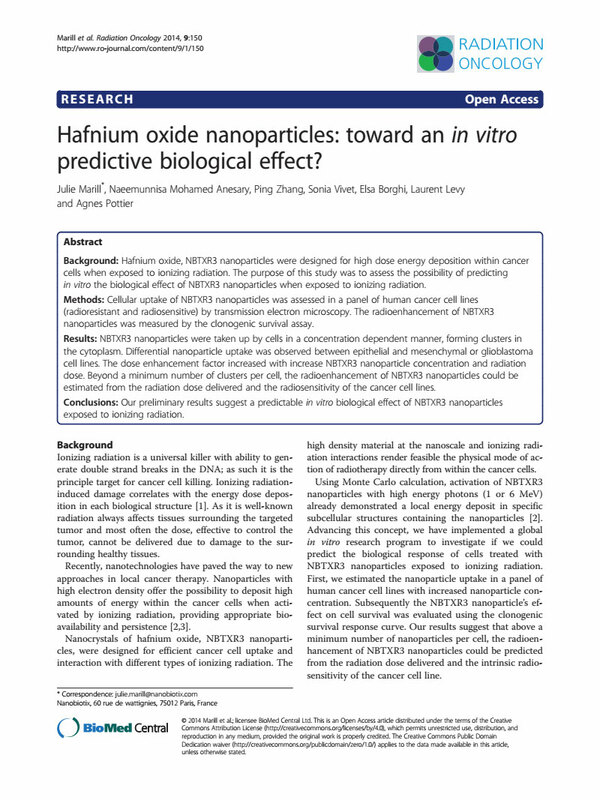 Background: Hafnium oxide, NBTXR3 nanoparticles were designed for high dose energy deposition within cancer cells when exposed to ionizing radiation. The purpose of this study was to assess the possibility of predicting the in vitro the biological effect of NBTXR3 nanoparticles when exposed to ionizing radiation. Methods: Cellular uptake of NBTXR3 nanoparticles was assessed in a panel of human cancer cell lines (radioresistant and radiosensitive) by transmission electron microscopy. The radioenhancement of NBTXR3 nanoparticles was measured by the clonogenic survival assay. Results: NBTXR3 nanoparticles were taken up by cells in a concentration dependent manner, forming clusters in the cytoplasm. Differential nanoparticle uptake was observed between epithelial and mesenchymal or glioblastoma cell lines. The dose enhancement factor increased with increase NBTXR3 nanoparticle concentration and radiation dose. Beyond a minimum number of clusters per cell, the radioenhancement of NBTXR3 nanoparticles could be estimated from the radiation dose delivered and the radiosensitivity of the cancer cell lines. Conclusions: Our preliminary results suggest a predictable in vitro biological effect of NBTXR3 nanoparticles exposed to ionizing radiation.